I said I didn’t need rubber boots because, in my words, “I’m not going in any mud holes.” I said this as my Dad, brother in-law and I were on our way to the north woods of Minnesota for our annual ruffed grouse hunt. I brought ample shotgun shells, food, water, warm clothes and, most importantly, plastic bags wherein to put the grouse meat. I was prepared. My only worry was that upon arriving, my phone battery was low. I shrugged it off, though, because I wouldn’t need it, of course. We arrived at our destination and assembled our gear and ATVs. We agreed to meet back at our starting point at 4 PM, then dispersed to our chosen locales and trails in pursuit of the plump birds. I went westward on a four-wheeler, a 2003 Honda Foreman Rubicon. After a short while, I got my first grouse and lit my pipe in celebration. I continued along in a haze of smoke and confidence, eyes peeled for a second bird. There was one particular spot that was excellent habitat for grouse, but it required navigating through a clearcut logging tract, which, with a four-wheeler, is tumultuous due to the overabundance of logs and large twigs. 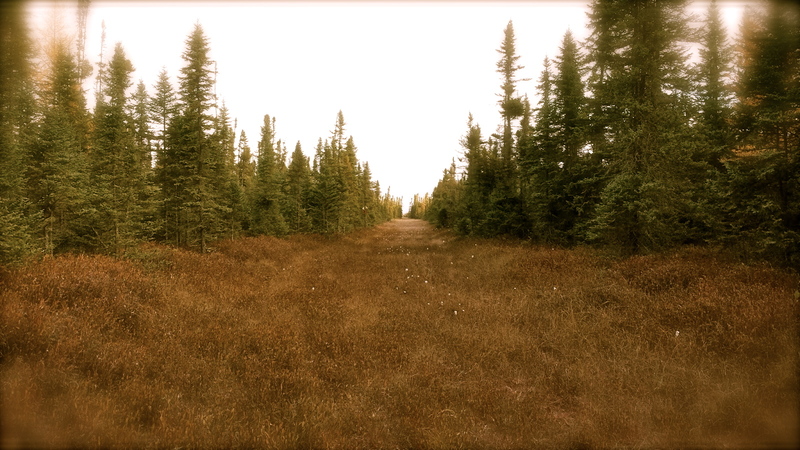 There was a way around the clearcut on a snowmobile trail, but the trail went through a swamp. Usually, a swamp is suicide for ATV travel, but this year the ground appeared dry enough to handle an ATV. So I gave it a go. I eased into it, testing the stability of the boggy ground. The earth was soft, but firm enough for the ATV, so I continued. It wasn’t long before I noticed a low section of the trail that looked like quick sand, but I went through it anyway…. I can’t describe the mud without using terminology associated with a latrine. It was soulless and hostile, as one would expect from a pit to the underworld. I put the ATV in low gear and flung the mud soup to the treetops, barely surviving death’s grip. I felt like a child who just broke the rules, trying to enjoy the thrill as I fought back the fear of being exposed. The wilderness landscape of the lowland was akin to a new world, eery and alluring. But the reason I crept into this death trap of a trail was to find the trail that would take me to my destination, so I ventured over the peat moss, scanning for it. There was no trail in sight, so I was forced to turn around and encounter the pit again. I drew up to it with apprehension. The black mud loomed and smirked, waiting for my next move. Instead of going right through it, like before, I attempted to stay on drier ground that was on my left. The dry ground wasn’t wide enough, though, which forced the right side of the ATV into the pit. I pressed the throttle to make it through, but the pit was like a vacuum, and the four-wheeler got eaten. Both of my right wheels were submerged in mud, while my two left ones were sky-high. I rocked the vehicle forward and back, attempting to break free, but it was useless. I was stuck in a swamp three miles from our rendezvous. I had 1% battery left in my phone, so I called my Dad, but there was no service. My phone battery then died. The four-wheeler had a winch, but it didn’t work. Remember Luke Skywalker’s X-Wing? Yeah, well, Yoda wasn’t there to help me. My 600-pound ATV was going no where. I stood on the dry ground, looking at the wreck. I wrapped my mind around the problem in an attempt to find a solution. Since I wasn’t The Hulk or Yoda, I knew I was doomed. After 15 minutes of futilely trying to lift the ATV, I abandoned the machine in a lathered mass of sweat and filth. I had to hurry because I only had an hour before our rendezvous. Grouse were at the back of my mind, and, of course, I saw three on my hike back. Two took flight and I quickly shot at the third, botching the shot mightily, and it took flight as well. My emotional life had better days. After the three miles of hiking, I arrived, humbled and angry. I joined my Dad and brother in-law to retrieve the ATV and used my cousins four-wheeler, which had a winch, to get it out. Without a winch, the Honda would have been in China next Spring. For the rest of that evening, I saw no more grouse. I had a bad day. My ego got hit in the goods with the only little mud hole in all of Koochiching County. When I was stuck in that pit, I prayed to God to help me out, but what I was really asking was to have the ability to get out. He answered my prayer, but in the worst way for the vitality of my ego: to make me walk three miles and get help from someone else. I was forced to cast aside self-assurance. Frankly, I was tempted to only take the lesson and forget everything else, including the beauty of the swamp–the smell of the mud, the air, the trees. How much of my life have I missed because I dwelt on the “bad” part of a “bad day” or “bad experience”? My mud-hole experience could have easily made me selfish, dwelling on my own failure, but God never gives us such messages that bolster selfishness. He points us to beauty, grace and lessons upon which to become more humble and selfless. Our identity isn’t found in mistakes, but in what God says. Knowing this allows us to tell stories about our mishaps with smiles rather than self-depreciating frowns. It allows us to remember the little things that are missed when we dwell on what we did wrong. God reminded me to forget my weaknesses–to forget myself–and to (retrospectively) smell the mud and enjoy it too. I now recall the mud, its smell, the scene of the hopeless ATV, the beauty of the landscape, and I smile.